The Book of Daniel, written in Hebrew and Aramaic, is a book in both the Hebrew Bible and the Christian Old Testament. The book is set during the Babylonian Captivity, a period when many Jews had been forcibly exiled to Babylon. It revolves around the figure of Daniel, an Israelite who becomes an adviser to Nebuchadnezzar, the ruler of Babylon from 605-562 B.C.E.. The book has two distinct parts: a series of six narratives (chapters 1-6) and four apocalyptic visions (chapters 7-12). The narratives take the form of court stories which focus on tests of religious fidelity involving Daniel and his friends (chapters 1, 3, and 6) and Daniel's interpretation of royal dreams and visions (chapters 2, 4 and 5). In the second part of the book, Daniel recounts his reception of dreams, visions, and angelic interpretations, speaking in the first person. The dating and authorship of Daniel has been a matter of great debate. The traditional view holds that the work was written by Daniel, a prophet who lived during the sixth century B.C.E., whereas most modern biblical scholars maintain that the book was written in large part during the mid-second century B.C.E. and that most of the predictions of the book refer to events that had already occurred. 2.2 Identity of "Darius the Mede"
The book was an important influence on later apocalyptic writing and attitudes in both Judaism and Christianity. The New Testament vision of Jesus coming on the clouds may have its origins in Daniel's vision of the "Son of Man" (Dan. 7:13), and the Book of Revelation also uses much imagery that appears to be directly related to Daniel. The book is placed immediately after the Major Prophets in Christian Bibles, but among the Writings in the Hebrew Bible. Catholic and some other versions of Daniel include material—such as the story of Susana and the Elders and Bel and the Dragon—which are not considered canonical in Protestant and Jewish versions. The first six chapters of the Book of Daniel present a series of court tales, instructive narratives, and miracle tales. 1. Training in Babylon. After being taken captive to Babylon, Daniel and his friends, Hananiah, Mishael and Azariah—all of whom are members of the Jewish nobility—are treated well. They receive new names—Daniel is Belteshazzar, and his friends become Shadrach, Meshach, and Abednego. They are to be trained for three years as courtiers, learning the language, literature, and customs of Babylon. However, they decline to consume the non-kosher royal diet. Their overseer worries that they will appear unhealthy, but after ten days on a strictly vegetarian diet, they appear healthier-looking than any other young men at court. 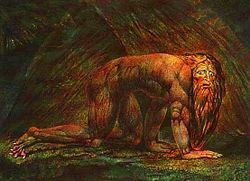 Entering the presence of Nebuchadnezzar, they are found not only to be good looking, but even wiser and more skilled than any of the kings advisers and magicians. 2. Idol with Feet of Clay. Nebuchadnezzar dreams of a dazzling idol made of four metals, with a head of pure gold, its chest and arms of silver, its midsection of bronze, and its legs of iron; but its feet are made of a mixture of iron and clay. The image is destroyed by a rock that then dominates the world. None of the Babylonian astrologers and wise men can tell the king the content of his dream or interpret it, and he orders all of them to be put to death, and Daniel and his friends are to be included in this punishment. Daniel pleads for time to interpret the dream. After he and his friends pray, Daniel receives a vision revealing the mystery. He tells Nebuchadnezzar the dream and interprets it as a series of successive empires ending with God's kingdom. The king is so impressed that he does obeisance to Daniel, placing him over the royal wise men and appointing Shadrach, Meshach, and Abednego as "administrators over the province of Babylon." 3. Fiery Furnace. Nebuchadnezzar creates a golden statue of himself and requires all of his officials to bow before it, on pain of death by fire. Shadrach, Meshach, and Abednego refuse on religious grounds, believing that God will save them from the flames. They are thrown into a furnace, but God indeed preserves them. Nebuchadnezzar sees them and a fourth figure walking unharmed in the furnace. Bringing the three out, he finds they are completely untouched by the flames. The king now declares that no one must speak against the God of the Israelites, and he gives the three Hebrews a further promotion in the Babylonian administration. 4. Madness of Nebuchadnezzar. This chapter begins with Nebuchadnezzar narrating in the first person, now apparently a convert to belief in the Hebrew God. He tells the readers of his dream of a tree so tall that it touches the sky: "Its leaves were beautiful, its fruit abundant, and on it was food for all." A "holy one" instructs that the tree be cut down, and its "stump" be transformed from a man to an animal. No one but his chief magician, Daniel/Belteshazzar, can interpret the dream. He regretfully informs the monarch that the king himself is the tree, and that he will be driven insane, living with the animals and eating grass, for seven "times." The prophecy is fulfilled a year later as Nebuchadnezzar hears a voice from heaven and promptly goes insane. Only when he repents of his sins and accepts Daniel's God as his own does he regain his sanity. Upharsin: Your kingdom will be divided and given to the Medes and Persians. 6. Lions' Den. Now the king is Darius "the Mede." He issues an edict that anyone who prays to any god other than himself in the next 30 days will be thrown into a den of lions. 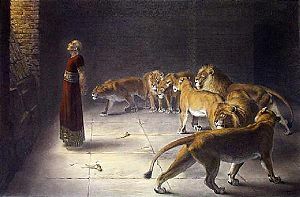 Daniel refuses to comply and is thrown to the lions, but they do not devour him. The next day, Daniel informs the amazed king that an angel was sent by God to shut the mouths of the beasts. Darius then decrees that Daniel's God be revered throughout the land. Two other chapters are included in the authorized Catholic version of the Bible, which are not included in the Hebrew Bible or Protestant versions of the Old Testament. These are Susana and the Elders (also called Daniel and Susana or simply Susana) and Bel and the Dragon. In addition, the Catholic version includes a prayer of Azariah in the fiery furnace, a brief account of the angel who met them in the furnace, and a hymn of praise sung by the Hebrew youths when they were delivered. The remaining chapters of the Book of Daniel are visionary, an early example of apocalyptic literature, in which the author, now speaking in the first person, experiences dreams and visions entrusted to him alone. One feature of this section is Daniel's reliance on heavenly figures to interpret and explain his visions. The historical setting of the first chapters does not appear, except in indicating the regnal dates in which the visions occur. In the first year of Belshazzar's reign, Daniel sees a vision concerning four terrifying beasts representing four future kings or kingdoms. Also included in this chapter is Daniel's vision of a "son of man, coming with the clouds of heaven," who is given eternal dominion of the earth by God (7:13). The fourth beast in the vision devours the whole earth, treading it down and crushing it (7:23). This beast has ten horns representing ten kings: an empire. A blasphemous king arises and rules, oppressing the saints for three and a half years. However, this person is judged and his dominion is taken away (7:26). Then dominion of heaven and earth is given to the people of the saints of the Most High (7:27). In Belshazzar's third year Daniel sees a ram and a male goat (8:1-27) which represent Medo-Persia and Greece. The vision focuses on a wicked king who arises to challenge the "army of the Lord" by removing the daily Temple sacrifice and desecrating the sanctuary for a period of 2,300 days. Daniel becomes ill after receiving this vision, admitting that, "I was appalled by the vision; it was beyond understanding." In the first year of Darius the son of Ahasuerus of Persia Daniel receives a prophecy concerning 70 weeks—or 70 "sevens." Daniel meditates on the prediction in the Book of Jeremiah that the desolation of Jerusalem would last 70 years and pleads for God to restore the holy city and it's Temple. An angel reveals to him that after a certain period, the Messiah will come and begin the rebuilding, but he will be "cut off," and a wicked ruler will arise who will desecrate the Temple and put an end to sacrifices and offerings. In the third year of Cyrus of Persia, Daniel receives a lengthy vision regarding conflicts between the "King of the North" and the "King of the South." Starting with references to Persia and Greece it culminates in the description of an arrogant king who desecrates the Temple, sets up a "desolating abomination," removes the daily sacrifice, and persecutes those who remain true to the "holy covenant." The Nabonidus cylinder reveals the historical existence of Belshazzar, but identifies him as the son of Nabonidus, not Nebuchadnezzar. Several issues arise for historians in reading the Book of Daniel, having to do with the identity of the supposed rulers under whom Daniel lived. For many years Belshazzar was an enigma for historians. The book of Daniel states that he was king the night that Babylon fell (chap. 5) and that his father was Nebuchadnezzar (5:2, 11, 13, 18). Prior to 1854, archaeologists and historians knew nothing of Belshazzar outside the book of Daniel. From that time, new evidence from Babylon has verified his existence, as well as his co-regency during the absence of his father. However, his father was not Nebuchadnezzar, as claimed by the Book of Daniel, but Nabonidus. In the Nabonidus Cylinder, Nabonidus petitions the god Sin as follows: “And as for Belshazzar my firstborn son, my own child, let the fear of your great divinity be in his heart, and may he commit no sin; may he enjoy happiness in life." Another statement indicates that Nabonidus "entrusted the kingship" to Belshazzar. The available information concerning Belshazzar's regency goes silent after Nabonidus' fourteenth year. There is no evidence that Belshazzar officially held the title of "king." No known extra biblical text indicates a blood relation between Nebuchadnezzar and Belshazzar. Identity of "Darius the Mede"
The Book of Daniel may confuse "Darius the Mede," a figure unknown to history, with Darius I of Persia. As Darius the Mede is unknown to any other source (except Flavius Josephus, many historians view his presence in Daniel as simply a mistake of a much later author, who has inadvertently placed the historical Persian King Darius I at an earlier date than when he actually reigned. Among writers maintaining an early date for the Book of Daniel, there are several interpretations of the identity of Darius the Mede. 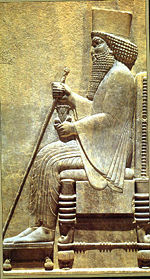 One view concludes that Darius is another name for Cyrus the Great. Another view is that "Darius" was actually the historical figure of Gubaru (sometimes spelled as Ugbaru). A third view sees Darius as another name for Astyages, the last Mede king, who was ultimately deposed by Cyrus. Josephus makes Darius the son of Astyages and the uncle of Cyrus. Calvin and others identify Darius the Mede with a certain Cyaxares II. A third significant objection by historians is the account of the insanity suffered by Nebuchadnezzar found in the fourth chapter of Daniel. However, in the Dead Sea Scrolls a fragment known as The Prayer of Nabonidus discusses a disease suffered by Nabonidus, and there are obvious parallels, as well as important differences between the two accounts. If indeed Daniel is mistaken regarding Nebuchadnezzar's madness, an obvious explanation may be that its author simply confused Nabonidus with Nebuchadnezzar, just as he mistakenly identified Belshazzar as Nebuchadnezzar's, son instead of the son of Nabonidus. 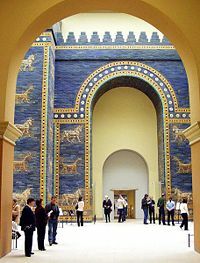 Traditionally, the Book of Daniel was believed to have been written by its namesake during and shortly after the Babylonian captivity in the sixth century B.C.E. Although this view continues to be held by traditionalist Christians and Jews, it has been discredited by critical scholars. These scholars propose that much of the book was written after Antiochus IV Epiphanes desecrated the altar of the Temple of Jerusalem around 167 B.C.E. In this view, Daniel was written in reaction to that incident. This theory also explains why the writer(s) seems so confused about the history of the kings of Babylon and Persia, when Daniel himself, living at that very time, would not have been. Textual issues are also cited in support of a late date, and issues of its unity are also raised. Some of Daniel is written in Aramaic while the majority is in Hebrew; and it appears to be a collection of legends and visions, rather than the account of single writer. The critical view thus affirms that, rather than being a prophecy of a time to come, the book actually sought to explain the spiritual meaning of the history already experienced by the Jews of the second century. It may have been used by the supporters of the Maccabeean revolt to mobilize popular support for their cause, which was ultimately successful in conquering Jerusalem and rededicating the Temple. Daniel's visions contributed to an increasing diversity of views in first century Judaism on such issues as salvation/redemption, resistance to Gentile rule, angels, resurrection, and the nature and mission of the Messiah. Daniel was a highly popular book among Jews prior to and during New Testament times. Along with the Book of Enoch and other apocalyptic literature, it was a major contributing factor to a trend within Judaism that looked to dramatic supernatural events, as well as political and social change, leading up to the coming of the Messiah. Indeed, the Messiah himself is described in Daniel not as the earthly descendant of King David, but as a heavenly "son of man" who comes on the clouds to rule the entire earth forever (Dan. 7:13). Rabbinical thought during the early talmudic era tended to discourage apocalyptic and messianic expectations, especially in the wake of the catastrophic Bar Kochba rebellion in which many tens of thousands of Jews lost their lives in support of Bar Kochba's messianic cause. Much popular apocalyptic literature was thus excluded from the Hebrew Bible, although some of it was accepted into the New Testament canon as the Apocrypha of the Old Testament. Daniel was accepted by the rabbis, but not as one of the works of the Prophets. Instead it is included as one of the Writings, and thus appears later in the order of the biblical books than it does in the Christian Bible. The Christian idea of Jesus returning on the clouds may have originated in Daniel 7:13. The various episodes in the first half of the Book of Daniel are used by Christians as faith-inspiring moral stories, and are often believed to foreshadow events in the Gospels. 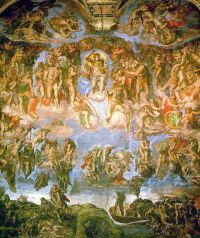 The apocalyptic section is important to Christians for the image of the "Son of Man" (Dan. 7:13), interpreted as referring to the Second Coming of Jesus on the clouds. According to the Gospels, Jesus used this title as his preferred name for himself. The connection with Daniel's vision is made explicit in the Gospels of Matthew and Mark (Matt 26:64; Mk 14:62). Christians usually see this as a direct claim by Jesus that he is the Messiah, although recent scholarship suggests he may used it in the sense that Ezekiel did, to refer to himself as a prophet and not necessarily the Messiah. Some Christians consider the Prophecy of Seventy Weeks to be particularly compelling in its reference to the Messiah (Jesus) being "cut off." In the Olivet discourse (Mark 13:14, Matthew 24:15), Jesus himself is quoted as applying Daniel's prophecy of a desolating sacrilege to a future event—either the siege of Jerusalem (70 C.E. ), or a future Antichrist immediately preceding Judgment Day. In 2 Thessalonians, Paul (or the person writing in his name) refers to the "lawless one's" coming as a prerequisite to the Second Coming. 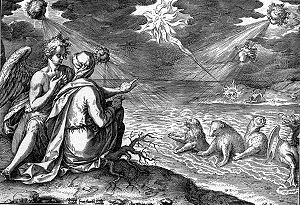 The Book of Daniel also seems to have been an important influence on the writer of the Book of Revelation, whose dramatic imagery of a beasts rising from the sea and other apocalyptic themes bear marked similarities to Daniel. Translation with Rashi's commentary – www.chabad.org. History of "Daniel, Book of"
This page was last modified on 16 November 2017, at 16:07.